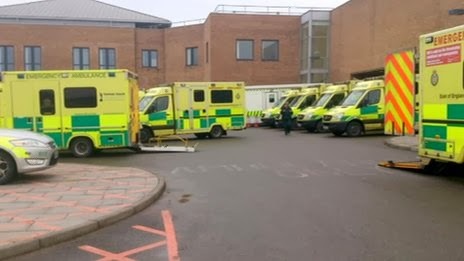 Following recent BBC coverage of unacceptable ambulance waiting times outside A&E departments (Ambulances 'face long delays at A&E' - BBC figures reveal), I was invited by BBC Radio 5 live to go on air to discuss the situation. It was disappointing that we did not have the opportunity to further discuss the relationship between frontline ambulance services and Accident & Emergency departments or the increasing pressure caused by more and more A&E closures, but most frustrating was the attempts by a man of some influence - the chief executive of the Foundation Trust Network no less - to brush the issues back under the carpet and claim that things are all right really. This seems to be a message which Mr Hopson has delivered in the past from the safety of a boardroom environment filled with charts and graphs. As I discovered last year with the former EEAS board, the capacity for detachment and delusion seems rife at this rareified level; a comfortable bubble of carefully engineered alternate reality in which executives can pat each other on the backs for jobs well done. Take it from somebody who has worked in the pre-hospital trenches for over a decade and still has regular contact with those who continue to struggle against strangled resources, draconian government policy and the kind of detached 'I'm sure everything's fine' leadership that Mr Hopson exemplified: the situation is nowhere near as rosy as he would have you believe. "Healthcare workers, I know you've had it rough lately, but I expect - as always - for NHS staff make the unworkable work and do more with less. Thanks for that by the way, I really don't know how you manage it year on year, but I thought I'd up the ante. Brace yourselves, things are about to get even worse, I've closed some more A&Es, removed some care pathways, messed with various established processes and provided funding for some nebulous private organisations. Like Mr Hunt, Mr Hopson may be able to find some comfort in the current healthcare climate but that is because he doesn't really know what he is talking about when it comes to the day-to-day realities of patient care. He may be able to recite statistics and figures and I'm sure he's very good at leading his organisation, but it is unlikely that he'll be the one struggling this Winter.